She was wonderful. Very open to the topics that I wanted to discuss and the staff was incredible as well! Willabsolutely turn to her for all of my GP and OBGYN needs moving forward. She was wonderful. Very open to the topics that I wanted to discuss and the staff was incredible as well! Will absolutely turn to her for all of my GP andOBGYN needs moving forward. Every one in Dr. Pederson's office was so nice and friendly. Very attentive, answered all of my questions. Great experience. Dr. Pederson grew up in Phoenix, Arizona. She earned a bachelor’s degree in biomedical engineering, followed by her medical degree from University of Southern California in Los Angeles. 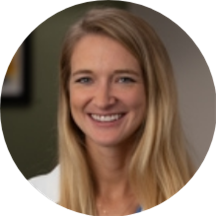 Prior to joining SCL Health, Dr. Pederson was an OB-Gyn intern and resident at the University of Alabama at Birmingham. Being a part of a woman’s healthcare journey is something that Dr. Pederson truly appreciates. Whether it’s delivering a baby, annual checkups, sick visits or surgeries, Dr. Pederson enjoys every single part. “I believe all women should love their doctors and have good relationships with them. I want all women and their families to feel cared for and listened to and feel like their needs are being met. I believe doctors should work with their patients to make them feel like their best selves in all aspects of life.” Some of Dr. Pederson’s clinical interests include obstetrics, high risk pregnancies, reproductive health, abnormal bleeding, infertility, menopause and hysterectomies. When she is not at work, Dr. Pederson enjoys hiking, dinner with friends, exploring new restaurants, playing outdoor volleyball, and watching her favorite football team, the Minnesota Vikings. This was such an efficient visit -- didn't wait at all and everyone was super friendly and helpful!